Miami, FL – April 3, 2018 – The Global Wellness Summit (GWS), the foremost gathering of international leaders in the $3.7 trillion global wellness economy, today announced the theme of its 2018 conference: “Shaping the Business of Wellness.” The 12th-annual gathering of wellness industry leaders, being held from October 6-8, 2018 at Technogym Village in Cesena, Italy, will focus on the current business landscape and future trends for the ten diverse segments that make up the global wellness economy. During the Summit, dozens of keynotes, panels and roundtables will take a deep dive into the big businesses of beauty, healthy eating, wellness tourism, fitness/mind-body, preventive/personalized medicine, complementary/alternative medicine, wellness lifestyle real estate, the spa industry, the thermal/mineral springs market and workplace wellness. 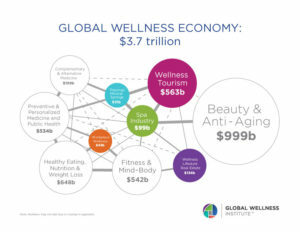 The Global Wellness Institute’s much-anticipated, comprehensive update of the Global Wellness Economy Monitor will also be released to delegates, providing all-new benchmarking data and trends for these ten markets, which will ground the discussions about the business of wellness in the latest research and analysis. 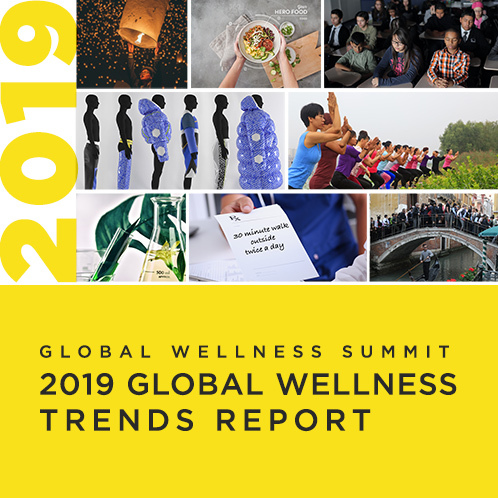 Since its first release in 2014, the “Global Wellness Economy Monitor” has become the go-to source of wellness market data for business leaders, researchers and the media–garnering many thousands of downloads and countless citations among press, industry and government users. The full 2018 report will be released and analyzed at the Summit, offering a completely updated picture of the size, scope, trends and five-year growth projections for segments within the global wellness economy, along with in-depth regional-level analysis and top country markets for six global regions. Delegates will mix the business of wellness with the pleasure of it, as the 2018 Summit takes place in Cesena, Italy, a town between the Adriatic coast and the hills of Emilia Romagna, a unique location called the “Wellness Valley.” A project begun by Summit host sponsor, Technogym’s CEO, Nerio Alessandri, the Wellness Valley has the goal of making the Romagna region the leading place in the world for wellness expertise and quality of life, immersing people in its unique local heritage: its people, history, traditions, art, nature, music, food and wine. At the Summit venue, Technogym, delegates will experience a 37-acre campus designed from the ground up to inspire the wellness lifestyle–not only in terms of physical fitness, but also with a focus on environmental sustainability, architectural wellness and mental wellbeing through the beauty of art, music and fashion. Technogym also features an expansive research and education center, state-of-the-art gym and farm-to-table cafeteria. Summit attendees will experience a slate of wellness activities, as well as a solid dose of “la dolce vita” that only Italy and the GWS can provide. This will include a Wellness Fashion Show at the gala on the last evening of the conference. For information about attending the Summit, click here. For sponsorship opportunities, contact: Michelle Gamble.